If a person in the private sector went to work one day, got belligerent with someone in another department, and then assaulted that person, they would not only be fired, but could also face jail time. However, if you are in the public sector, like a police officer, you can be grossly negligent, abusive, and assault someone; instead of being fired or facing jail time, you can go on a paid vacation and keep your job. Such was the case with Oklahoma Highway Patrol trooper Daniel Martin. In 2009 Martin decided that it would be a good idea to pull over an ambulance for failing to yield to his squad car; never mind the fact that the ambulance had a sick woman in the back, bringing her to the hospital. Martin became belligerent at the scene when the ambulance drivers wanted to continue on to the hospital and ended up assaulting and arresting driver Maurice White. Charges were eventually dropped against White and Martin went on an all expense paid, tax payer funded vacation. Now five years later, after never being fired for his grossly negligent and abusive behavior, Martin is unsurprisingly in trouble again. A new complaint against Martin alleges that he showed an “inappropriate adult photo – not of himself – to a fellow trooper,” Captain George Brown, of the OHP, said in a news release. “The incident was reported to Academy staff, who decided since Trooper Martin’s son was attending the academy, it would be best to release Trooper Martin from this special assignment. The finalization of the incident is pending,” Brown said. Corruption and misconduct are seemingly commonplace within law enforcement. 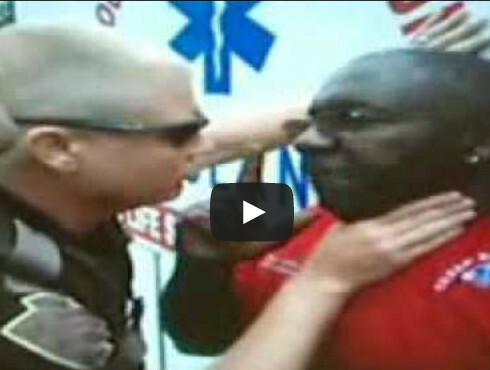 Cops in America, can murder a man on camera, and walk free. As long as the tax-payers keep rolling over and keep apologizing for the ‘bad apples’ nothing will ever change. We are literally financing our own oppression. It’s high time we demand change. It’s time to imagine a post police world.